Why is a software petition important? Two weeks ago, we launched a petition to see how many people agreed that software is fundamental to research and, if we overlook this fact, that we lose our ability to make groundbreaking discoveries. How will the petition help make a difference? The purpose of the petition is to raise awareness of research software. Every person who signs, everyone who retweets and - importantly - everyone who talks about the petition in their groups or offices, helps make more researchers think about their use of software. The more of those people who sign up, the easier it is to persuade research stakeholders that they must change their policies to support software. And that's not just research funders in the UK, research funders in the Australia, Canada, Germany, Netherlands, New Zealand, Poland and the US are currently working with us to develop similar policies in their own countries. Profile raising might seem a bit flimsy, especially when you consider the fact that the people we are asking to sign up are working on everything from curing cancer to understanding the very workings of the universe. But it's not the only thing we're doing to change the way that the research community deals with software. Since its beginnings in 2010, the Institute and all the groups we've founded or partnered with, have achieved a huge number of practical, concrete changes that help support research software. Our developers have improved research software for groups around the UK, that expertise has been distilled into guides that have been visited over 50,000 people, we've trained over 1000 researchers in basic computational skills, we've made steps towards getting UK academia to accept a career path for professional software developers (Research Software Engineers) and, most importantly, we're keeping up the pressure on research stakeholders to make sure that changes continue to occur. We do this work because we believe that it leads to better software, and that better software leads to better research. Training researchers or improving software is incredibly important, but when talking to time-pressed policymakers, it lacks the punch of something like a petition, which shows a groundswell of support for a concept. And this is why we started our petition, because it's important not just to make real concrete changes in the research software community, but also to convince people outside that community of the importance of research software. 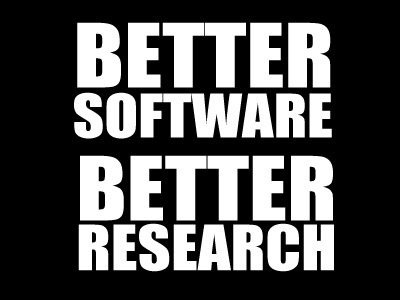 If you believe that research software is important, sign up to the petition!